The OU Lies Again: Meat Hook Throat Probing Not USDA Mandated – Meat Hook To Throat "Part Of Glatt Kosher Slaughter"
I spoke yesterday with Trent Berhow, the vice president of the National Joint Council of Food Inspection Locals, and with Jim Shanahan, head of the local in Grand Island, Nebraska. Shanahan told he he watched the latest PETA video with Dr. York, the veterinarian in charge of Humane Slaughter for this region of the USDA's Food Safety Inspection Service. Dr. York, Shanahan, said, had been in Rubashkin's Gordon plant a week or so before. Dr. York defended everything on the PETA vido, telling Shanahan that everything was done according to regulation. When Shanahan pressed him, Dr. York explained the,, from the moment the animal enters the slaughter box until the moment it is removed from that box, the USDA has nothing to say or do about what takes place. The USDA, Dr. York told him, does "not interfere with glatt kosher slaughter." Dr. York's statement is inaccurate. Humane Slaughter law does regulate what happens during kosher slaughter, even glatt kosher slaughter. I believe Shanahan's and York's references to "glatt" kosher slaughter mean that Rubashkin – the largest glatt kosher slaughterhouse in America – is getting preferential treatment, treatment other kosher slaughter operations are not getting. But this remains to be seen. I called Dr. York to ask him about this. He refused to speak and referred me to his district office. The district office also refused comment, referring me to the spokesman for the USDA FSIS, Steven Cohen. Cohen, you may recall, told me last week, repeating it almost as a mantra, that the USDA "does not interfere in ritual slaughter." Shanahan told me clearly the procedure done with a meat hook a few seconds after slaughter is not USDA mandated or requested, confirming what Steven Cohen told me last week. This means this is a procedure instituted by Rubashkin and his rabbis. This also means Rabbi Seth Mandel, head of shechita (ritual slaughter) for the OU, lied about this when he claimed the USDA mandated the procedure. Or it means he has no idea what really takes place at Rubashkin's plants. Dr. Temple Grandin told me that this procedure is not USDA mandated, that it is cruel and that it should be stopped. 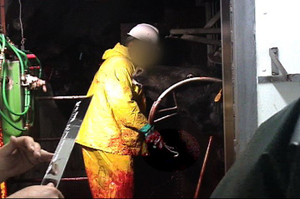 The meat hook is used to speed bleeding. It is not part of kosher slaughter. Rather, it is a dressing procedure meant to reduce the amount of blood splash and bruising in the meat, which reduces the meat's value. This primarily effects the non-kosher market, which purchases more than 65% of Rubashkin's meat. What this means is that the rabbis who supervise Rubashkin, and who promised to stop this cruelty 2 1/2 years ago when the Postville scandal broke, have not kept their promises. It also means the USDA can no longer be trusted to supervise Humane Slaughter. Jim Shanahan was appalled by what he saw on the new PETA video. But he is powerless to stop it. Why? I believe because of corruption that runs deep within the USDA and, it seems clear, the Bush Administration. There is, in my opinion, no way to know if the meat you eat was slaughtered humanely and the rabbis we entrust with certifying the kosher status of that meat have repeatedly proven untrustworthy. What you do with this information is up to you. 2 1/2 years ago, I stopped eating meat and fowl when I realized the rabbis were playing fast ands loose with the truth. While I encourage you to do the same, the choice, and its consequences, are ultimately yours.